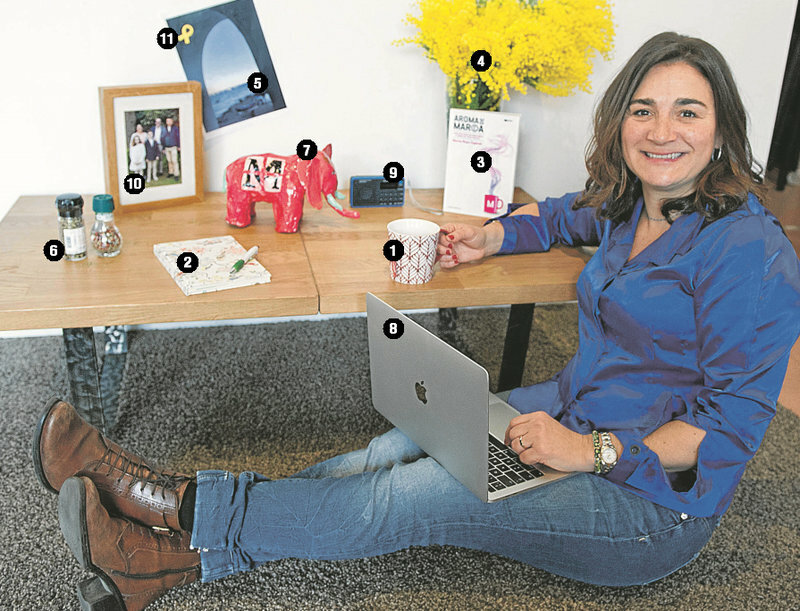 An economist by training and an advertising expert by profession, Marta Royo founded Mosaiking Comunicació in April 2011, and not long ago published her first book, Aroma de marca (Cossetània edicions, 2018). Dynamic, positive and passionate about her work, her family and her neighbourhood of Sarrià in Barcelona, she is also the mother of three children. What’s the secret of her energy? She shared with us a few tips and the most important elements in her life and career. 1. A good tea. I prefer Earl Grey, to start the day with energy. Each day when I wake up, I look for the energy inside myself. Tea gives me the balance and strength to enjoy a new day. 2. A roller pen and a notebook, to note down any idea that comes into my head. I always have pen and paper to hand, as you never know when inspiration might come, and when memory might fail you. 3. Books. Especially my first book, Aroma de marca, which I consider my fourth child. After two months on the market, it accompanies me everywhere. Fifteen real-life stories, entertaining and funny, with tips that help to create a brand and promoting it. 4. A vase with flowers. I love flowers. They are my visual company. I like my environment to be visually pleasant. Flowers help me concentrate when I’m working. Not only by looking at them and smelling them (I absolutely adore the mimosa, now in season), they just make me feel better. 6. Spices. Life, like cuisine, has boring and bitter stuff, but also tasty, sweet and spicy flavours. I find that spices provide a magic touch (both in life and cuisine). I am passionate about cooking. It relaxes me, calms me down, inspires me. It gives me such a great feeling! My star dish, paella, is my own recipe, with a touch of saffron, white pepper and cinnamon. 7. The magenta elephant. My second son, Joan, made it for my birthday. It has a special place in my office. It is my amulet, my fetish, with the power of bringing good luck. 8. My Mac. I have my whole life stored on it. The almost eight years of Mosaiking Comunicació are in there. I do make security copies, and I also have it all in the cloud, but God forbid it ever gets lost. 10. My people. Family, friends, colleagues. Without my people, I’m nobody. Personally and professionally. 11. The yellow ribbon. The latest, and one of today’s symbols, that I identify with most. Without freedom, we are nothing. No need to say anything else.